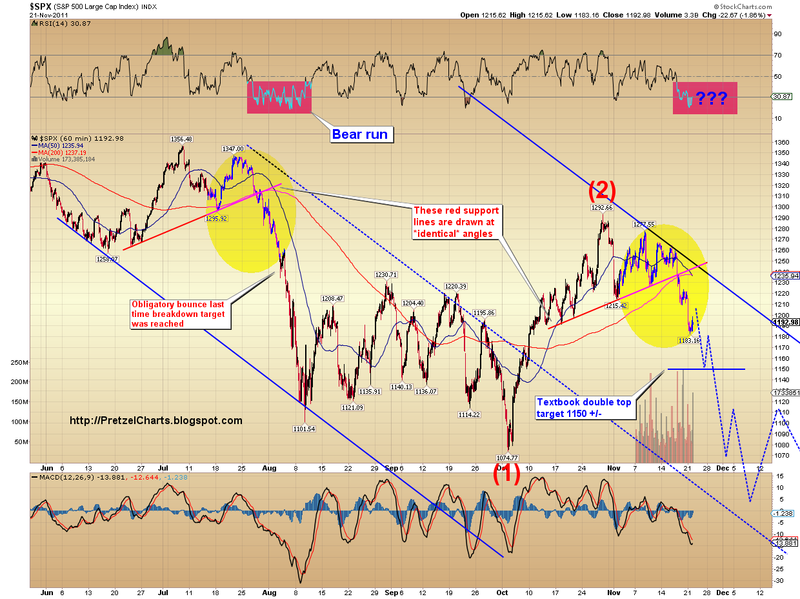 Pretzel Logic's Market Charts and Analysis: SPX Update: Will the Waterfall Crash Continue? SPX Update: Will the Waterfall Crash Continue? So far, the market has lived up to my prediction of a waterfall decline, and now everyone wants to know if it's going to continue. Today we're going to take a look at a few things and try to answer that. We can see there were very similar top formations in both instances, and we can see that last time, there were bounces the whole way down. And yes, I continue to favor a waterfall decline (or "crash" if you prefer) going forward. Note that the target for the top formation the market just completed, using classical technical analysis, is around 1150. It would not be unreasonable to expect some sort of bounce from that level. One of the things I like about the waterfall decline scenario is that the market action of "ratcheting" lower discourages shorts, and encourages longs. The momentum never gets going down fast enough for the momentum traders to pile in, and it pauses just long enough to convince people the decline is ending. This causes a max pain effect, which is what the market seems to enjoy doing to everyone. Shorts either cover or don't enter, and longs keep buying and then getting creamed. But make no mistake, under my preferred scenario, there will be lots of little bounces along the way. The market never moves straight up or straight down. Now that the market has provided another piece of the puzzle, I have been able to clean up the charts a bit. Although my preferred count is bearish no matter how you slice it, of the various ways to count the current decline, I continue to favor the nested 1-2 count by a slim margin. Call it 57.756% probability (I considered adding like 90 more digits to that -- be thankful I'm really tired!). This count can be eliminated from contention if the SPX trades above the blue wave 2 high at 1223.51. If this count is playing out, we could still see some rally today, but when it turns, the next leg down should show increasing momentum over yesterday's move; and the overnight futures sessions will likely create cash market gaps such as yesterday's. 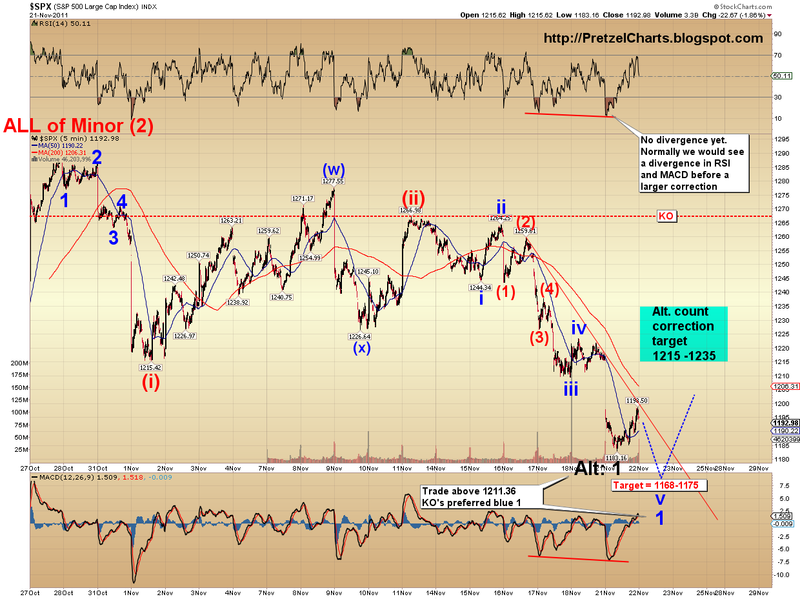 The more conservative way to count the decline using Elliott Wave is presented below. What I do like about this count is that it allows for the "seasonality" factor. The Wednesday before Thanksgiving has been a positive market day in 8 of the 9 prior years. Of course, none of those prior years featured the Congressional Stupor Committee, who, after months of heated negotiations, was finally able to tentatively agree on catering. However, this is still subject to future review. Who knows what impact that may have on things; maybe that's why the nested 1-2 count has always looked more probable to me in the charts. Anyway, the chart below is the "conservative" bearish count. Under this count, it still looks like the market needs a lower low before we have a day or two of "happy rally time" before heading lower again. The alternate black count considers the possibility that Happy Rally Time is already here. Trade above 1211.36 rules out the preferred count; trade below yesterday's low rules out the alternate. And of course, no discussion would be complete without mention of the short-term bullish alternate count. If that count is playing out, change the blue and/or black "1" in the above chart to "C," and up we go, right on into the 1300's. I continue to discount the probabilities of that count to about 15%. In conclusion, my medium term target for the SPX is still 1000-1050; I'm just trying to pick nits over the short term. Today looks like it could potentially see some continued rally early on (although that could be viewed as complete or nearly so), but I expect any rally will ultimately lead to lower prices. Trade safe. You did the right thing. None of us... especially you, needs that kinda distraction. Sleep, maybe... drama... no. And yes... I would suggest putting th paste in the locked cabinet... you know how us kindergarteners are! ty, yeah, it's sort of a shame, because he had some insightful things to say -- but he just couldn't say them without insulting people in the process. maybe the bounce is done - e mini futures took us to 38% retracement -- a weaker retracement than would be normal for wave 2 (i think) except for maybe a wave 2 of wave 3. Pretzel please fix any of this thinking if wrong. or maybe retrace makes sense with this as wave 4 before wave 5 lower low which you mention Pretzel. If the market's as weak as I think, it works with either count, really. Markets with this much selling pressure seldom see deep retracements, unless the "they" can get the shorts panicked. trend's still intact. We'll see how they do at the bottom yellow trendline. Interesting. The dollar JUST BARELY held the pivot it needed to for the possibility to remain open that it, too, is building a nest of 1's and 2's. Morning. Looks like TZA is right back where I sold it yesterday - should have just held. Now I'm worried to buy back in here. I kind of like the drop to 1170, then bounce to 1220ish count. Any thoughts? Try to catch the falling knife for some upside, or should I re-short here. News is uber-bearish as usual after several down days which seems contrarian and ripe for a bounce. But if we take yesterday's low, it's almost certain that either the conservative bear count, or the uglier bear count is playing out. Heh what did I do? I never insulted people right? Of course! I took on a very small position on the open expecting more people to sell, particularly with the downward GDP revision and bad Europe news. Its tiny compared to my prior position so I'll probably average a little if we bounce to 1195, then jettison if it looks like we're going to test the 1204/1207 area or higher. Nevermind - I'll bail if we hit 1195. I'll wait for the break of 1183 as you suggest or start layering in a larger position at higher levels. Rough morning - more coffee for me. check out this chart -- 50/150/200 ma having a meeting of the mind at 119 (12 pts below current island) -- plenty of gaps to fill on the way down. Home of the $10 soup and bread. Love Panera and their stock seems bulletproof. Those short the stock got clobbered last earnings. Careful with that, though I would definitely expect it to go lower as the broad market landslides. Good on you, I agree his style of communication was insulting. Thanks for doing the silver chart Pretzel. NP Frank. Looks like a pretty solid chart. Really want to trace it backwards, though. It's tough because silver had different "value" throughout history in different cultures. It was used along with gold as currencies in many cultures and its purchasing power varied too. Yeah, my 600 yr. silver chart shows a high of like $1500/ounce back in the 1500's or something. @ B.O.B. -- I like the fact that shorts were squeezed post 3Q - mgmt seemed to pull out the stops on the "guidance" and "talk" around current numbers. Not sure what is left to "sell" to the street. Bulls are no match for your Ghanian (?) party hat! Any idea why I don't see timestamps for the comments here? Is that a configurable option? Lack of timestamps makes it tough have context when you go back and read older posts. It's some glitch Disqus has with interacting with certain browsers. For me, timestamps show up on IE, but not Google Chrome. Potential's also there for this to be a tiny B-wave triangle. Probably a good time for me to try and get some sleep. Running on fumes right now. 2 hours, plus about an hour nap yesterday evening. Brain melting... fingers tired... screen blurring and words getting difoonable. I'm sure you guys will be able to fend off anything bully throws atcha, with Jaco and Rocky both present. Also do NOT show up on Firefox 8 - however, Mavrich was kind enough to point out that I could click the post and drag left to make them appear. Inconvenient, but it works. Is that the end of 1190? Anyone adding shorts here? FWIW, Jaco, I've sniffed Lusaka's air. Was en route to Malawi, and Lusaka was the stop before the ef of the line at Lilongwe. I remember the aircraft door opening at Lusaka, the air wafting in: my first proper smell of Africa! I added to my Nasdaq position a bit higher than here. I am think of adding to my Crude oil shorts here but feel a bit jittery as on account of yesterdays price actions. PL i'm interested in a quick blush look at CL nothing too deep or time consuming. I just made an offering to the trading gods by selling some of my long spy put position. I still believe short and hold is the way to go here, but want less risk on as I have family coming into town tomorrow and can't be watching the markets tomorrow. Now that i've lightened up, markets can proceed to waterfall lower today...Now back to my 'real' job. ...But if we take yesterday's low, it's almost certain that either the conservative bear count, or the uglier bear count is playing out. "Just took out yesterday's LOD. Only been to Egypt (in Africa), spent 1 week, had some salad at an upscale restaurant I thought would be safe. nearly died from a nasty parasite. Otherwise the trip was awesome. I would go to most anywhere anytime. I also strongly believe Friday will be an up day, not a slaughter. Everyone knows it will be light volume, no inst'l money in their right mind would plan on liquidating Friday. Up from where remains to be seen. are they gonna try to get back to 1200? Looks like you may have called it. Keeping my fingers crossed. it's all to calm....I think Uncle Ben is pumping some serious money. it goes down, and here come the buyers....again...wearisome! making new lows for the last few days and you look at the vix and think we found out North Dakota was made out of gold....hmmmm???? Very interesting article on Market Watch, just as PL has been saying. I see. It's there but black text on a black background. Wonder why it's different from browser to browser. Wonder if today's marginal new low, to 1281.65, could have been it for wave v. It will be interesting to see what Pretzel thinks. Maybe we're starting the correction to 1215+, or maybe we're still in the nested 1-2 count. I think we'd have to take out the 1198.50 level to KO that - is that correct? Rock - I'm still bearish - but keep an eye on the channel - we broke out and are surfing above - may make for C wave move to 1200. The B wave should've taken us lower but the PPT couldn't take the pressure so they released the IMF story to pop the market and run the euro to try and get the rally started. I would love to visit Egypt still and yes you are right - I also love travelling and am priledged that my "day-job" takes me to many different countries. Yes, loved Lusaka too. Great people as well. Unfortunately had to spend most of the week at the office, so didn't see all that much. During my next visit I'll definitely try and visit Livingstone to see Vic Falls also from the other side of the Zambezi. Hope you are right Rocky, otherwise Pretz is going to fire us! I drew a retracement from the breakdown at 1265 +/- to the 11/17 low of 1210 +/-, and 1281 is almost at 1.618. 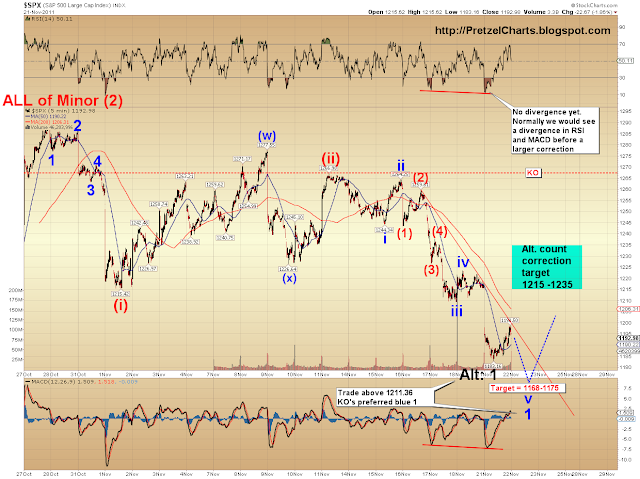 Could this be the start of a corrective wave to 1215 maybe? Put shorts on WTI via the SCO etf at $40. Would be interesting to see the latest EW count on oil. Looking to see a move below yesterday's low, hopefully to the $95 level. Interesting. Seems plausible to me. Maybe I was too quick to put those oil shorts back on, if it decides to trade inline with equities. WIll place a stop at today's low on SCO, and keep powder dry. I also unloaded some TVIX near the low to preserve ammo for later. HOD got blown out, but didn't last long. Surely, not even the bulls can see this as very convincing? ES bounced off Pretzel's light bluish resistance line (can't seem to repost his chart, browser issue?). The hint of EU liquidity took SI on a wild upswing though. Not sure if any one else here is trading oil or is interested, but I bailed at $40.40. Got a quick 1% gain and I am beginning to think we may have started the Turkey Day counter trend rally. This of course means that the great oil sell-off of 2011 will commence. the longer the market stays at this level, the less likely we get much of a bounce IMO....tettering with another flat correction. Didn't you hear, oil is going higher since the world just found out Iran has nukes. Gotta keep up with the headlines! :) Got nothing to do with supply and demand. Clearly. Even supply and demand are distorted at will by the big players. 'Analysts' would give ridiculous figures for Cushing inventories then oil would rally hard because the draw-downs were more than anticipated. The demand destruction has been papered over. But the Saudis just gave up on a project to produce even more oil because they see the writing on the wall. Yet oil is higher because the big boys speculate this will reduce expected supply. Its really a clusterf**k.
The way I'm reading it (looking back at Pretzel's post), since we KO'd the LOD from yesterday the alternate count is out, and the preferred count is in. But I'm a newbie amongst the newbie crowd. If bulls can defend here and push a little higher we could have a mini inverse h&s pattern forming. And with the seasonal bias we could see prices go (slightly) higher tomorrow and Friday. they are going to push it higher into the close.....yet again.....will it fall in the last five minutes....like yesterday...or will it push through 1200???? 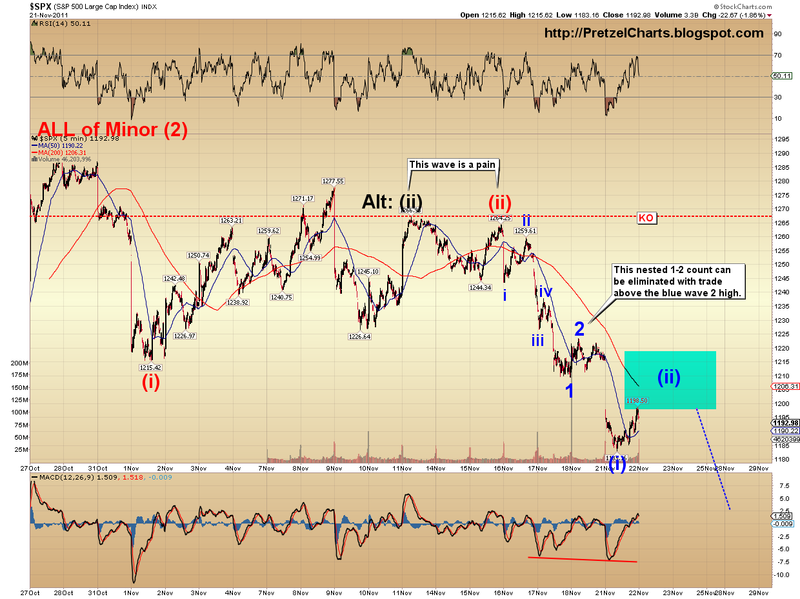 Michael R - as I re-read Pretzel's commentary, I was confused by the 'conservative' bearish count. "Under this count, it still looks like the market needs a lower low before we have a day or two of "happy rally time" before heading lower again. The alternate black count considers the possibility that Happy Rally Time is already here. Trade above 1211.36 rules out the preferred count; trade below yesterday's low rules out the alternate." Had not even bothered today to look at the shhttload of ever boring bloggers herein, and I found it amusing that PL wrote earliest his morning that he had "banned" my IP. Amusing. I have a roaming worldwide IP, that resets when I reboot. Whatever. Yet I see that pretentious trailertrash 'brainturd' did not drop his usual crap herein today, so site is improving. It strikes me that PL was predicting a day like today or even a bit higher, but was uncertain whether the market would hold due to the overnight action. Looks like it pretty much held in place giving the impression that he would expect another leg down tomorrow before a happy rally. That has been my take on what he is saying. I shorted oil via SCO at 39.00. I am holding for awhile and betting oil goes back down in to the 80's. It looks to me on the daily chart the MACD is just starting to turn up. My guess is that oil continues lower along with the dollar higher. If it is so boring here, why bother popping round? I normally try and avoid "pretentious trailertrash 'brainturd's", just a pity they "anonymously" creep up on me from time to time and then overstay their welcome! I bet I have read PL's paragraph at least a dozen times as I watch this infuriating market. Make new lows, rally back.....and as someone said....rinse and repeat. Am a I totally lost (wouldn't be the first time....or the last, I suspect), or is that close? Anyone feel free to chime in.....please! Just to clarify....the first paragraph in my above post is extracting from PL's post from today!!! Looks like Anon20 found a break from his anger mangement therapy group. Frankly, I would agree with you. (The Germans will probably keep their lips sealed, but with the French anything is possible. No offense to any French out there.) It looks like a toppish pattern so far, but I could see it extending a ways and even bumping a bit higher. I am short and won't likely add too much more. looking for another leg down to lighten up and then a happy rally to really bear down on. It just hit the target zone today, although it looks like there's still more downside there. A20, just do me a favor and don't rip on people. I was actually sad to have to ban your IP (apparently that didn't work, lol), because you do generally add to the discussion (plus you crack me up sometimes). But you can do so without insulting people in the process. If you think a particular person is an idiot (or a particular group of people here), just ignore them. Arguments are actually much more powerful when they're subtle; as soon as one starts throwing out buzzwords and name calling, they weaken their position -- and the argument becomes meaningless and droll. Sorry if you found my comments confusing -- I was incredibly tired last night, and I have no doubt the article was lacking its usual clarity. The lower low today COULD have marked a truncated fifth wave (fell short of its expected targets) to complete the blue pattern on the conservative chart... however, I don't think that's what happened. 1) today was part of a more complex correction, with a little more upside to go before lower prices. 2) today was the first wave down of a new impulse lower, and the snap back was the first corrective leg... and we go decisively lower tomorrow. I honestly haven't looked at enough charts yet to have much of an opinion on which it was, but those are the possibilities. More "Verbal QE3" as I call it. Seems to be working less and less for them, as anticipated. Boy who cried wolf scenario. Didn't play that one, but I'm hopefully going where no man has gone before with Captain Kirk. We'll see how that one goes. Pretty sure Shatner is going to continue negotiating some higher prices for my puts. Holding at 400% gains right now... although, I wouldn't be surprised by some drawdown tomorrow. PL, new to your site, started lurking end of last week. EWT reminds me of quantum mechanics, is it real or is it memorex, but that's because I don't understand either. Have really enjoyed your articles, and the community. I mostly trade crude, but looking forward to learning EW and trying some SnP trading. Hi, Wile E, thanks and welcome! Funny you mention quantum mechanics; that's another field I find incredibly fascinating and have studied on and off for about 20+ years (ever since I first read "The Dancing Wu-Li Masters"). It's IE. This Disqus comment format is buggier than a sleazy motel room. I have to switch to Google Chrome when I post images, but back to IE since Chrome doesn't display time stamps. It's totally bizarre. Yeah, I'm going to do an update on oil this weekend. There should be some good "easy money" plays there, if I'm reading the chart right. @ william Yeah, seems like those light sessions (such as Friday) are always Bully's playground. Pretzel - looks like your pref count is the bomb.... Futures just touched 1170- you're like the magic 8 ball but you actually have answers. Seems like market sentiment has everyone waiting for little rally to reload shorts or offload longs and the market is just not obliging. lol, TY POTUS. We'll see if the bears can push through 'til morning. That's five consecutive sessions closing lower! As for you problem child, that character cracks me up too sometimes, only I suspect for different reasons than you. For me it's the comical hypocrisy. All of the childish name calling - INTERNET YELLING, internet insults and the failure to realize how childish and self descriptive those are as he hurls them. I haven't been around much yesterday or today, but he was throwing a temper tantrum like a 2 yr old on Monday "threatening" lol that he would come back and talk so much filth that it would make you cringe. Maybe he did and that's why you banned his IP. Which led to another laugher "I have a roaming worldwide IP, that resets when I reboot." Talk about pretentious and dumb, that's DHCP LMAO!! I have that as well btw. Its hilarious to me that this character really acts as though he believes that his internet insults and name calling are hurtful or effective, so I laugh when he talks about his 'fury'. I could care less if any of that is ever hurled at me, I would laugh even more and expect that sooner or later it would be regardless of this post. I've participated in forums that are very caustic and profane, and I've been to plenty of hell holes around the world, possibly even the hell hole he came from, so it doesn't faze me one bit. I know that isn't the type of community you want here and it doesn't belong here, so I am not saying any of this for the sake of instigating but face it Pretzel, characters such as that are all over the internet and if IP banning didn't work you may not have many other options besides deleting. That is unless you actually believe that someone so who claims repeatedly that they will leave would actually do so. OK, most of that wasn't about the markets or your charting, but couldn't exactly ignore the elephant in the room,but I'm not going to dwell on it much either. No worries. I thought that things were getting complex. china PMI, lowest since march 2009...the last leg holding this market up is coming down. I have traded a long, long time, with many different pros, but I have seldom seen someone nail the market as well as you. Congrats, man. You are in a real roll. Sticking with that top call probably ranks as one of the three hardest calls I've ever made... between the "bullish triangle continuation" everyone else was calling for, and all the "amazing fixes!" to Europe's problems, and the sheer vagueness of the waveforms, and the fact that it just seemed like no other analyst was on the same page as me... feels good now to have put in all the many hours of work, and to keep coming out on the right side. ES trend channel breakdown in effect right now (see chart). If bulls can't rally back up into the channel, there's Big Trouble in Little Bullyville. Green- "INTERNET YELLING" made me laugh out loud. but one of the things I do during third wave declines is pick an entry point to get stopped INTO the trade. If I can watch the market, I'll protect that with a super-tight stop (out) at first -- and if I get whipsawed a couple times for a point or so each time (ES), and have to keep reentering, that's fine. When third waves get cooking, price points that are normally retested in a "usual" market don't get retested, the market just keeps dropping... so my tight stop, who-cares-about-whipsaws approach has always served me well in the past during 3rd waves, if I needed it (usually needed it because I got too fancy trying to pick bottoms, lol). When you finally get that "right" entry, it makes up for all the little whipsaws, 'cause the market drops 20,30,40 points from there and doesn't look back. And if you're wrong, you only take a tiny loss. You're not entering it as a swing trade, you're entering it to chase, so you have to be super careful not to let the trade get out of hand -- on the off chance that you just entered short 3 points from the bottom. Not advice of course, just one of the strategies I've used if I needed to. great work! seems like today is the day. The thesis of so-called US and China "de-coupling" is looking shakier after y'days Q3 GDP revision down and now this China PMI. The "decoupling" proponents might cast their minds back to late-2007/early-2008 when "EM decoupling" was all the rage, and look where it got them then. That would be the bullish alternate count. I'll post an update of it with tomorrow's update -- but I'm still only giving it 15% odds. I'm going to say a bit about "money on the sidelines" but I'll post it at the top. “cash on the sidelines” as if it is spendable in aggregate immediately reveal themselves to be unaware of the concept of equilibrium and of the nature of secondary markets (where there must be a buyer for every security sold, and a seller for every security bought). exactly what a trade is. Prices move because the buyer is more eager than the seller, or vice versa." Let's imagine some fund manager is sitting on $200 million "cash on the sidelines." He decides to buy stocks with *every single cent* of that money. So is that money now "invested in the market"? Nope. Obviously, it went to the people he bought the stock from -- and now THEY have $200 million in "cash on the sidelines." There is always cash on the sidelines, and there always will be. It's a zero sum game. I heard this argument parrotted time and again by people *the whole way down* in 2008. It's a myth, and if you hear some analyst start talking about it, change the channel, 'cause they don't know enough to keep their jobs. You'd have think they'd have figured it out after '08. ty- I was typing mine while you posted this, lol. Mine's a lot simpler, but the argument is the same. When I saw you were going to post something on "money on the sidelines", I *knew* you'd write the exact opposite of the normal nonsense that's trotted out by the regular suspects. Good stuff, PL. And congrats to you for "knowing better." Euro/dollar took out an important support level. ES back-tested the yellow trendchannel I posted and failed. So far, tonight's looking like a good night for bears. DanC- I can't find your comment about Disqus anywhere on the thread, but I received it in my email, so I assume you were having some kind of trouble w/ it. Seems to be working fine here. I'm amazed "the they" have kept ES as elevated as it is, with the EUR/USD knocking out critical support. Morning, Eur at 1.3376, down almost 1%, that's a huge move!